Volunteering at events is just one way you can help the Mayor's Alliance and our APOs. 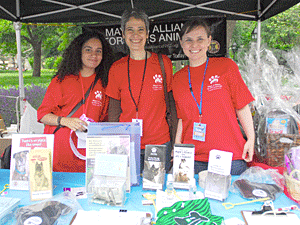 There are lots of ways you can support the Mayor's Alliance for NYC's Animals and our Alliance Participating Organizations (APOs). The Mayor's Alliance for NYC's Animals is a 501(c)(3) non-profit charity that works with more than 150 partner rescue groups and shelters to offer important programs and services that save the lives of NYC's homeless animals. Our collaboration has succeeded in saving more than 300,000 lives since 2003.We are supported entirely by donations from foundations, corporations, and individuals and receive no government funding. With your help, we remain committed to transforming New York City into a community where no dogs or cats of reasonable health and temperament will be killed merely because they do not have homes. Dedicate any special occasion to NYC's homeless pets or community cats! Make the most of your big day by setting up an online fundraising page for the Mayor's Alliance for NYC's Animals in honor of the special events, people, and pets in your life. Volunteers are a critical part of the success of animal shelters, rescue groups, and welfare efforts, and essential to achieving our collective goal of saving the lives of homeless animals in New York City. We want to help you find a way to volunteer that offers you an experience that you can both enjoy and feel is making a difference. Foster volunteers provide temporary care for dogs, cats, or rabbits in their homes, offering these pets much-appreciated time in a real home setting instead of a shelter or boarding facility while they await adoption. Most animal shelters and rescue groups are always looking for committed and reliable foster volunteers to care for animals in their homes while they await permanent homes. In fact, many rescue groups rely exclusively on volunteer foster homes because they do not have a shelter to house their animals. Even if you can't donate, fundraise, volunteer, foster, or join the Miles For Paws team at this time, there are lots of other ways you can help the Mayor's Alliance help New York City's animals!